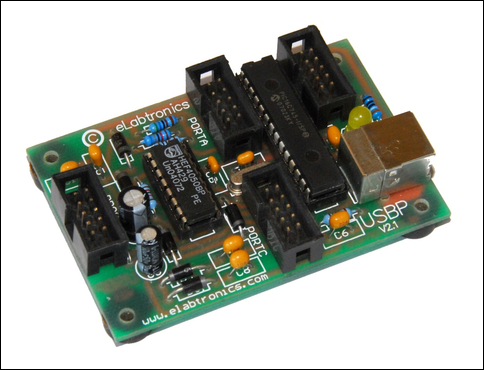 Last week in Part 1 we introduced the eLabtronics EZ system. In short, the system consists of low-cost electronic modules that can be programmed with easy-to-use software allowing them to perform a myriad of functions. If you’re interested in custom electronics for cars, model railways, solar energy, alternative powered vehicles, low voltage lighting – or hundreds of other uses – then this system is for you. The cost is low, the functionality is high and the creativity is in your hands. This week, we’ll start building a programmable temperature alarm – and let me tell you, you’ve never seen DIY electronics as straightforward as this! Our starting point is the eLab6 EZ Starter Kit and an eLab6. 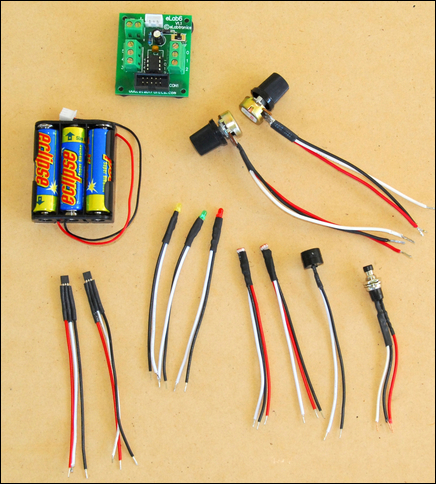 This costs AUD$44.50 (+GST) and comprises the electronic module, temperature sensors, light sensors, LEDs, buzzers and some other assorted components. 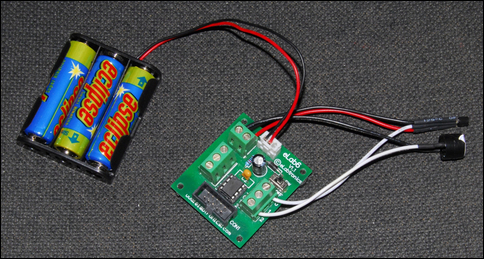 With just these components, you can make lots of ‘real world’ projects, including the temperature alarm covered in this story. To program the module, you’ll also need the Programmer Module that costs AUD$40 (+GST) including cable. The Programmer can be used many times to program different hardware modules – it’s a one-off investment. (Making it an even better buy, the Programmer can also be used as a PC data logger see - Five Channel USB Data Logger, Part 1). ... and ezCoreChart software packages. Install these programs and you’re ready to begin! 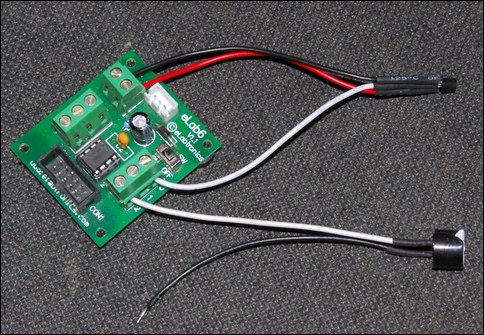 In this story we’re going start developing a programmable temperature alarm – it will take only a short time and you don’t need any existing programming or electronics knowledge. So how will our temp alarm work? Electronic systems can be broken down into inputs, outputs, and the brains that work in the middle. For example, let’s look at how this applies to the programmable temperature alarm. Here is the input/brains/output idea applied to our temperature alarm. 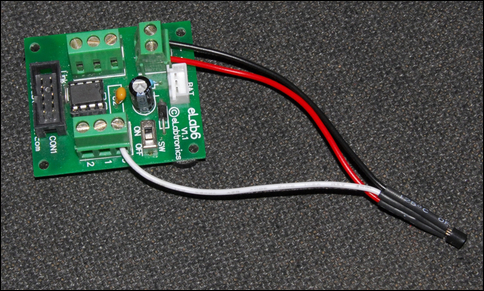 The input is a temperature sensor, the brains comprise the eLab6 module, and the output is a buzzer. That all seems pretty straightforward – so let’s now do it. 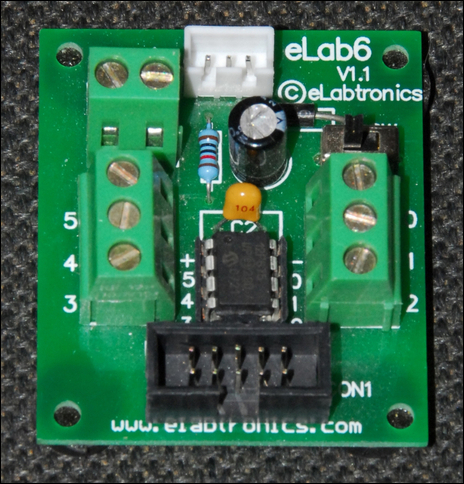 Place the eLab6 electronic module on the desk in front of you. 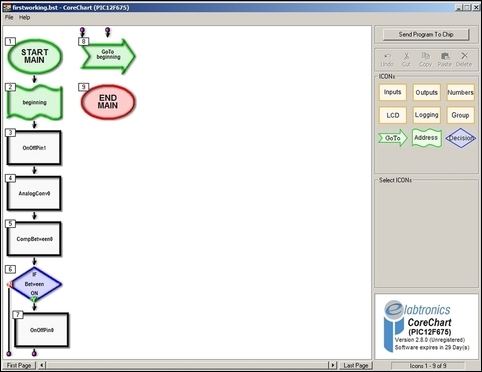 Orientate it so that the multi-pin programming connector is at the bottom. You can see on the eLab6 that the connectors on each side are numbered – 0, 1, 2, 3, 4 and 5. 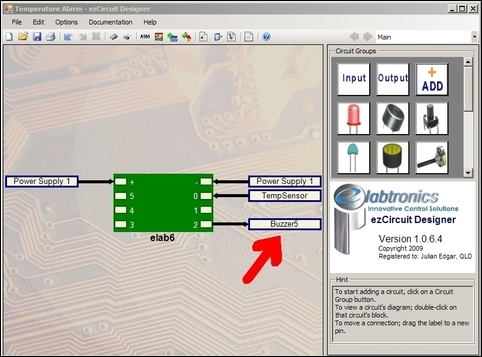 The same numbering system is used on the eLab6 shown in ezCircuit Designer on the screen in front of you. 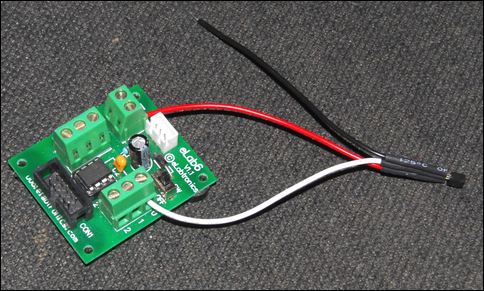 The (+) and (-) connections are for power – they can be made by either plugging-in the supplied battery pack OR by connecting 5V to the (+) and (-) connector on the board. OK, time to make some on-screen connections! The first wiring connection is for the temperature sensor. 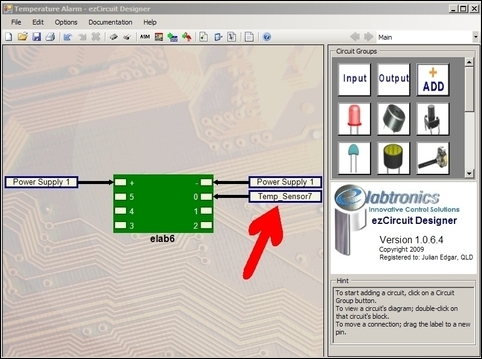 On ezCircuit Designer, temperature sensors are shown by the symbol highlighted here by the red arrow. Click on the symbol and the different types of temp sensor appear in the list below, with LM35 Temp Sensor Chip the highlighted first entry on the list. 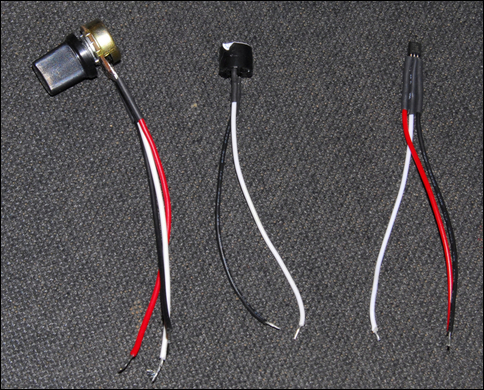 That’s the sort of temp sensor supplied with the eLab6 EZ Starter Kit, so no change in selection is needed. With the temp sensor selected, click on the pin you want to connect the sensor to. Here we’ve picked ‘0’ – you do the same. It’s a very good idea to rename the inputs and outputs, using names that you can easily understand. 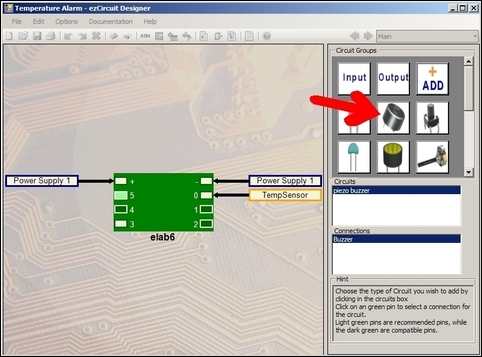 Right-click on the Temp_Sensor7 name and select ‘Rename’. Delete the existing name and call it TempSensor. OK, so that’s the temperature sensor connected. 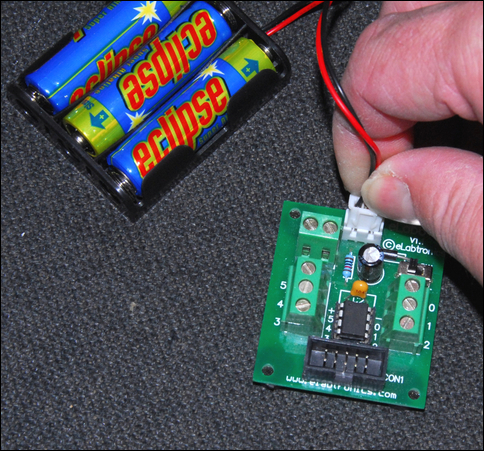 Now we need to connect a buzzer – remember, the Temperature Alarm we’re building sounds a buzzer when the temperature is too high. 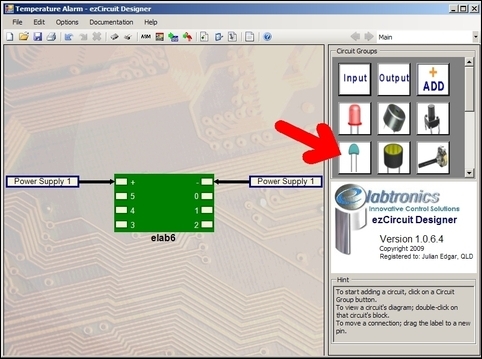 Select a buzzer (shown here by the red arrow) and decide where you want to connect it. Connectors 1, 2 and 4 or 5 are free and so any of these can be used. If you haven’t already done so, save this file as Temperature Alarm. So let’s take stock. We’ve just connected the input (the temperature sensor) and the output (the buzzer). But hold on! We’ve only connected them on-screen, not to the actual hardware module! 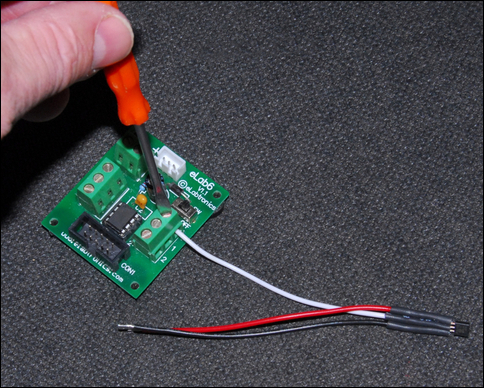 The first step in wiring is to make sure the module is switched off. 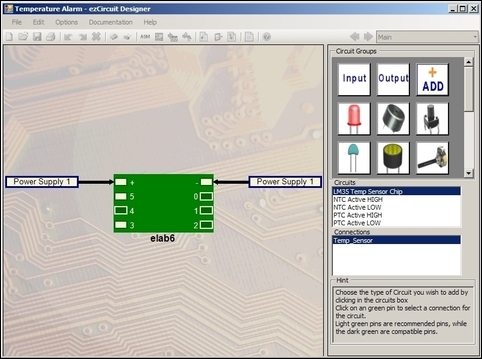 All the eLab6 EZ Starter Kit components use colour-coded wiring. This makes the connection of the temp sensor and buzzer really easy. Let’s start with the temp sensor. 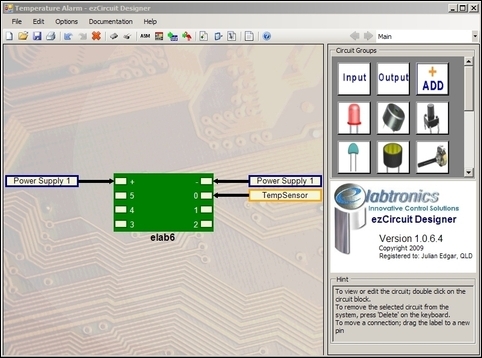 When we used ezCircuit Designer, we wired the temp sensor to Connector 0. 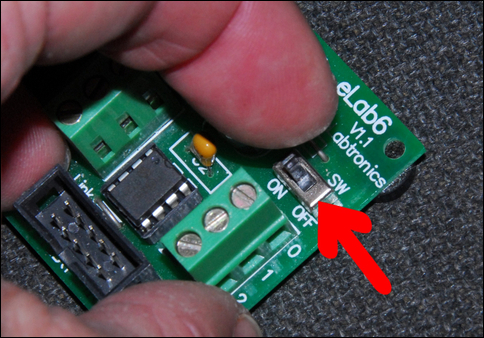 The white wire of the temp sensor therefore connects to ‘0’ – after the wire is fully inserted, use a small flat-bladed screwdriver to tighten the connector. ...and the black wire to (-). 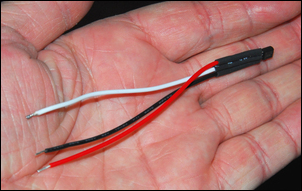 In all eLab6 EZ Starter Kit components, the white wire connects to 0, 1, 2, 3, 4, or 5, the black wire to (-) and the red wire to (+). ...and the black wire connects to (-). Finally, plug in the battery pack. Now we can go to the next step of writing the software that will run the Temperature Alarm. How? We’ll find out next week.